I made this card using the wordbook section of Funky Hand Craft the Year Away CD, but I didn't want to make it as a book. 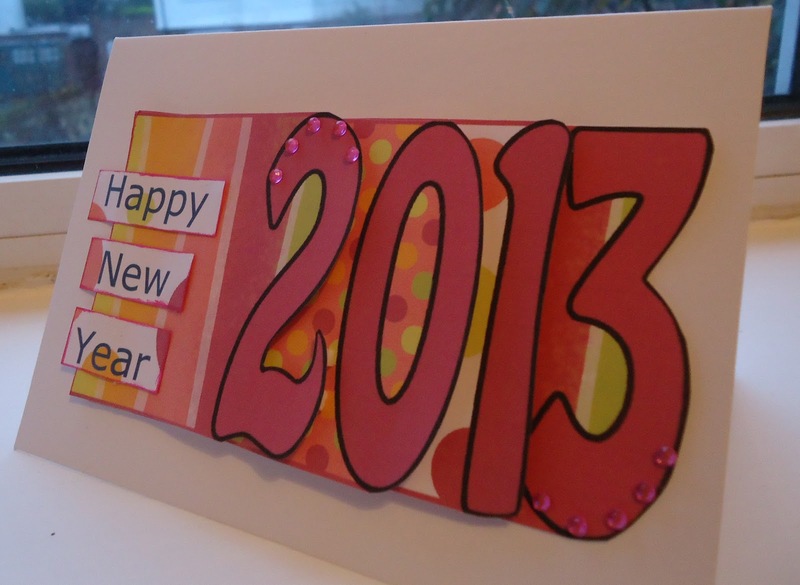 Instead I stuck it to a card blank and used 3d foam to raise up the numbers. (As usual, it doesn't show so well in the photo) . I typed the sentiment and added pink adhesive gems. Why not join in the giveaway at Inkspirational Challenges? It seems ages since I made something just for fun, with no specific purpose. Its been all Christmas cards, gifts, specific birthday cards… Tonight I looked at some of my favourite challenge blogs for inspiration and came up with this. The stamp is by Paper Artsy/Inkadinkado (it says both on it) and it’s the first time I’ve used it. I used a brush to stipple ‘Salty Ocean’ Distress Ink onto a manila tag and then stamped the image, slightly off centre , in ‘Chipped Sapphire’. Actually the off-centre bit was a happy accident!! 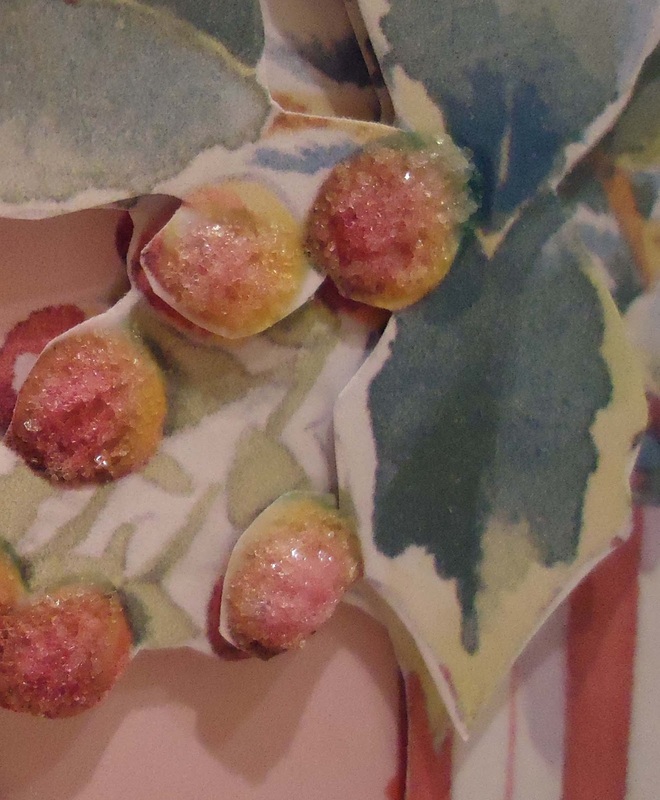 I stamped again onto white card and paper pieced fragments of the image. I edged the tag in silver pen and added eyelets. The alcohol ink background was a leftover and I added a ribbon border. 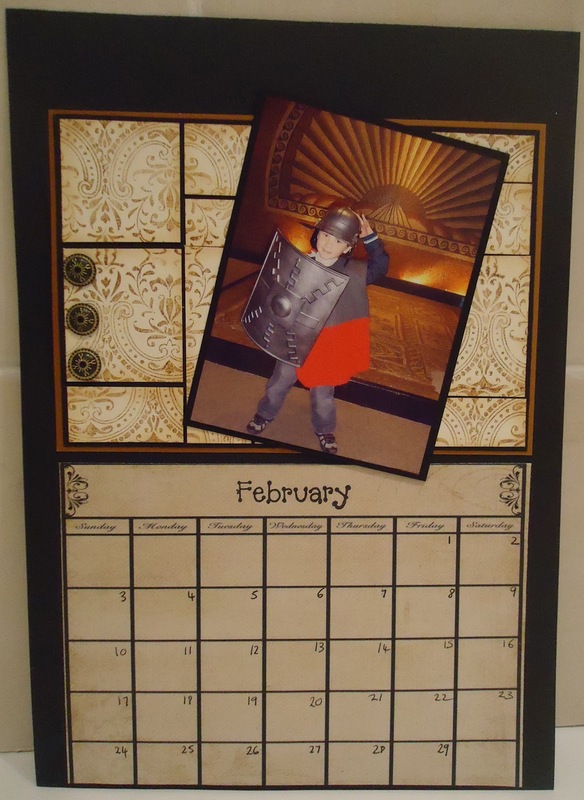 At last, I’ve finished the calendar for my son’s grandmother- and she’s arriving tomorrow! I do one every year and have to keep coming up with a new twist. 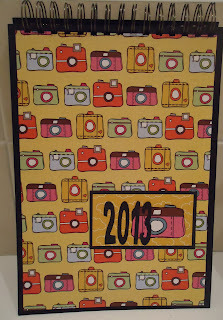 This year I used black card as the background, a calendar template from here and my Bind-it-all. While I’ve got you, don’t forget to come over to the new Inkspirational Challenge Blog, sign up for a prize in our giveaway and get ready for our first challenge on Jan 2nd. While visions of games consoles danced in their heads. It’s Christmas Eve and my little boy has gone off to sleep with less messing about than usual! Just time to wish all visitors to my blog (and especially those who are kind enough to follow me) a very happy Christmas. 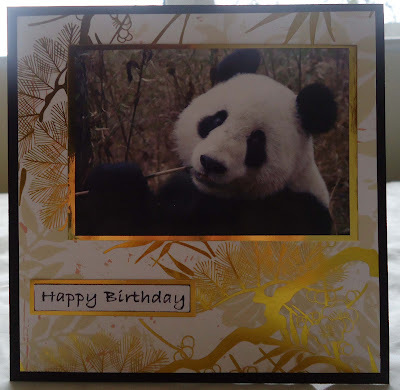 While I was finishing up my Christmas –card-making my daughter requested (with 2 days notice) a birthday card for her friend who loves pandas. This is what I came up with. The photo is a public domain image and although the design is simple, I was quite pleased to be able to meet the brief at such short notice. 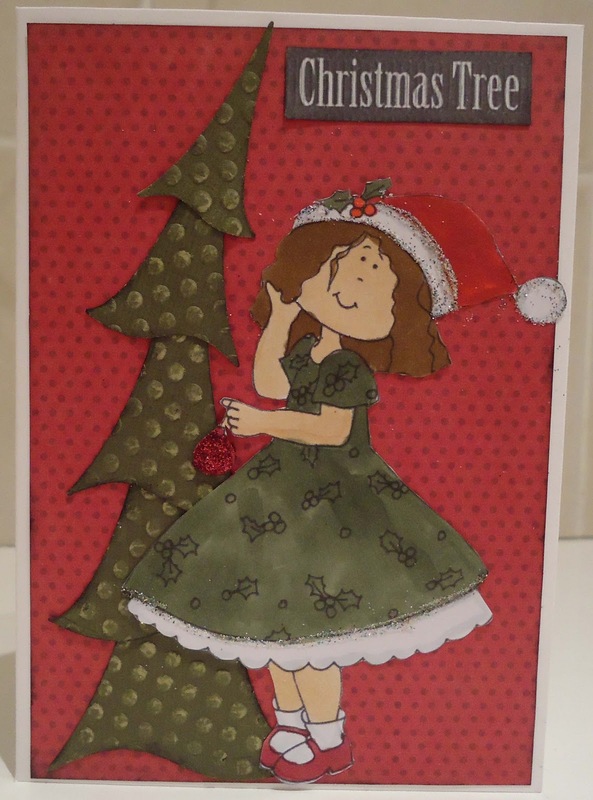 Finally, don’t forget that the fantastic giveaway on the new Inkspirational Challenge Blog starts on Christmas Day. Please pop over there and get involved. My brother’s wife’s birthday is January 2nd . She’s a stylish woman who loves to shop, so when I saw A Day for Daisies new release I knew I’d found the perfect image for her birthday card. 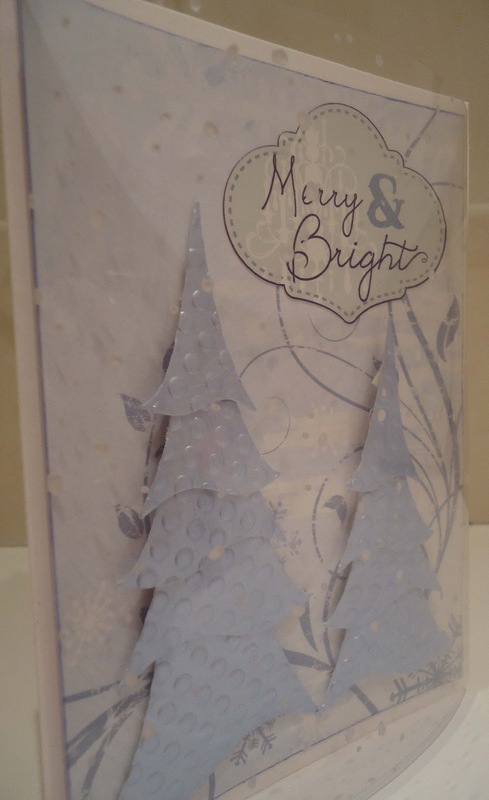 The papers are all from Christmas packs but I hope it’s a nod to the the season without looking like a Christmas card. I added the text SALE – to the bag. The embellishments are Papermania and I used a sketch from Corrosive Challenges. A Day for Daisies are a sponsor of the new Inkspirational Challenges blog , of which I’m excited to be a Design Team member. We will be having a launch giveaway with lots of great prizes, so do come over and follow us. I've kept my gift tags really simple because I'm going to have to make LOTS of them. 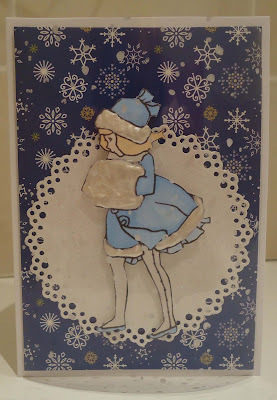 I covered the tags with distress inks and stamped with a snowflake stamp (a Craft Stamper freebie). Then I stamped the 'Do not open..' stamp in black. 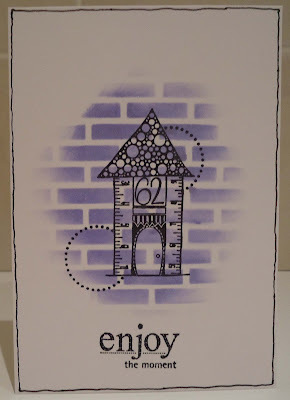 This stamp is by East of India, who I think are more of a gift company than a craft one, but they do a small range of rubber stamp sentiments which stamp beautifully. The two biggest tags are a slightly different shade to the others- that's because they were manilla luggage tags and the others were die cut from white card. I was busy procrasting with making the annually expected calendar for my son's grandmother when Mynette ( On a Stampage and the new Inkspirational Challenge Blog) left me a message drawing my attention to the challenge on Technique Tuesday - Faux Tile. 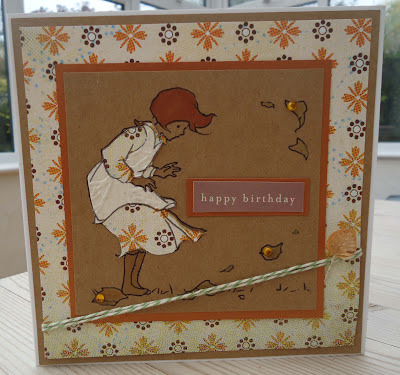 I used a Kanban stamp with a repeatable pattern and Vintage Photo Distress Ink on cream card. 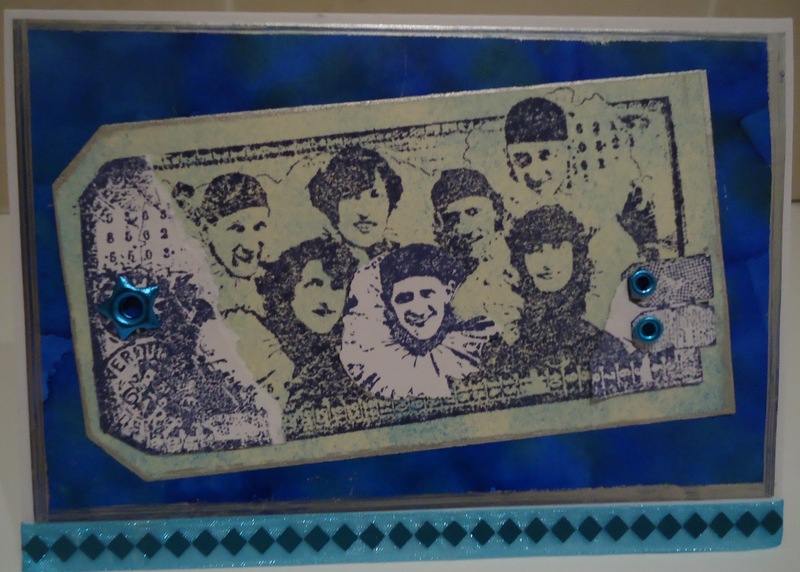 I added 3 Stampin Up brads. There's a big gap at the top as I intend to bind it with the Bind-it-all. I did find this technique quite tricky as I always stick things a bit wonky. But it was fun trying! Hooray! No more work till 2nd Jan! One of my colleagues didn't make it to the end of term celebrations because she had an emergency operation a few days before. 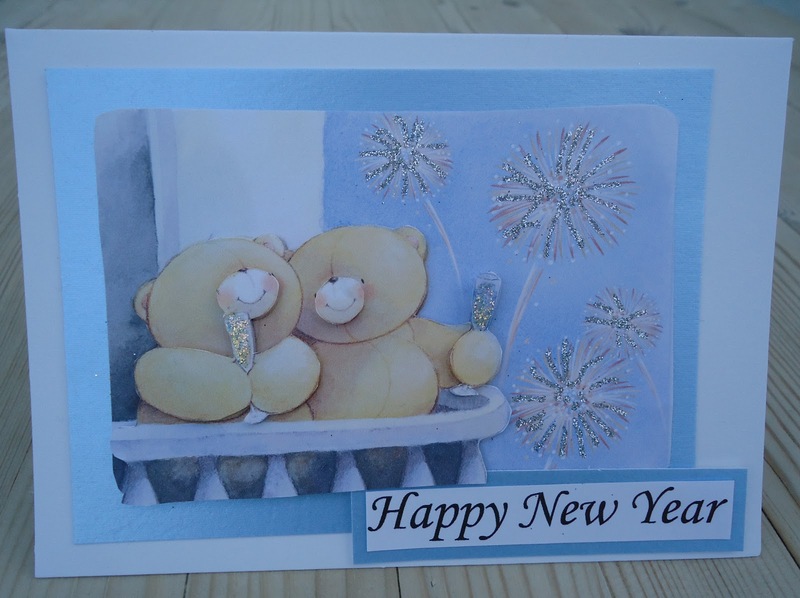 We sent her a 'get well' card, but I didn't post her Christmas card as it was quite bulky, so instead, I thought I'd make her a New Year card for when we go back. This weeks challenge at CD Sunday is 'Teddy Bears'. 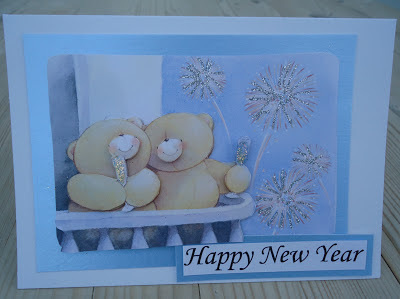 This image is a decoupage sheet from Docrafts Digital Designer/ Forever Friends Celebrations CD . 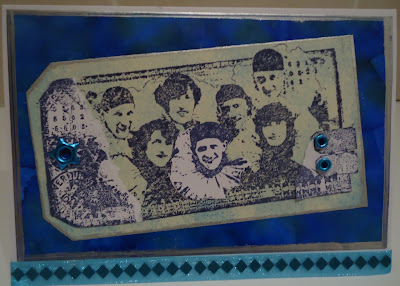 I decoupaged for 3 layers and added glitter to the fireworks and bubbly. This is nothing like a Christmas card is it? 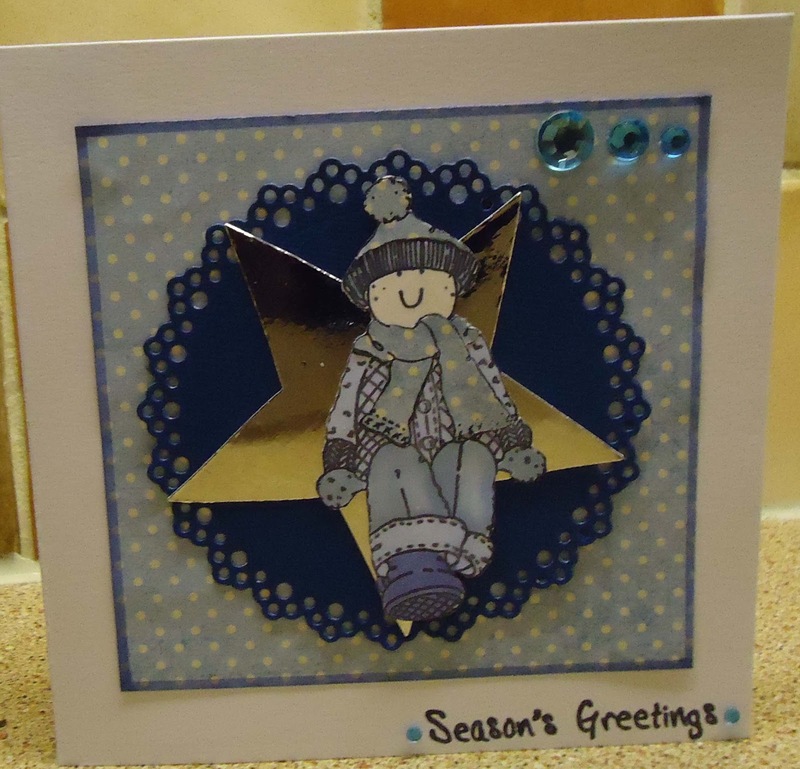 Which is just what I wanted - a little break from Christmas before I go back to make my gift tags etc. 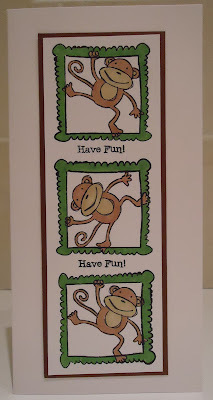 Browsing the challenge blogs, I noticed that both Opus Gluei and Daring Cardmakers had a 'monkey' theme. Daring Cardmakers also have a prize from the Ribbon Reel. 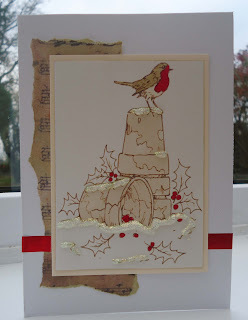 Aside from a few quick and easys, this is pretty much my last Christmas card! Hooray! I'm looking forward to doing something different. 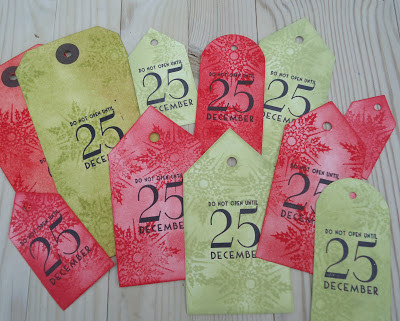 Although as I write this I'm realising I still have gift tags etc to do! 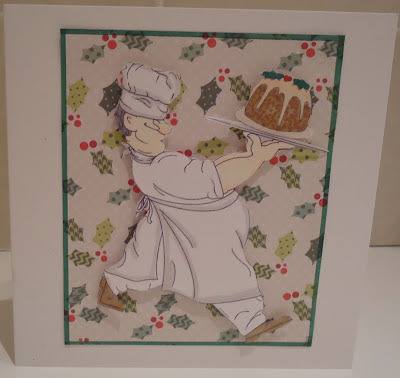 This is another one of the cards for my colleagues. 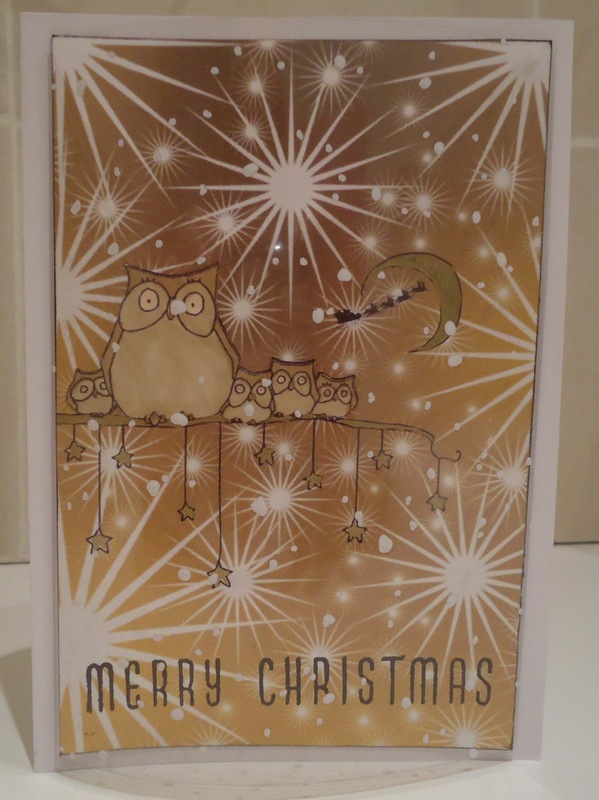 Just as I was making the cards, my colleague commented that she was 'into owls at the moment'. I'm not sure what she meant by that but it was enough to inspire me to make this card for her! The owls are an A Day for Daisies digi and the background and santa sleigh are from a My Craft Studio CD. 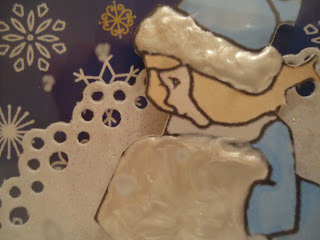 I used Hunkydory Snowfall Acetate to make a domed front. All that glitters ....is very hard to stick things to! 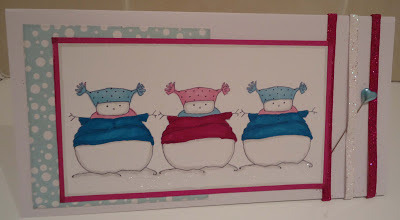 I used white glitter paper for the background here and then struggles to get the embellishments to stick. 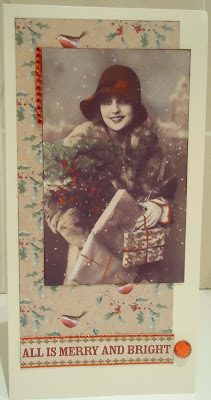 The images here are from Debbi Moore Christmas Bookazine CD. I cut out a second image and stuck it over the first with 3d foam, so it looks like the sledge is coming out the picture. 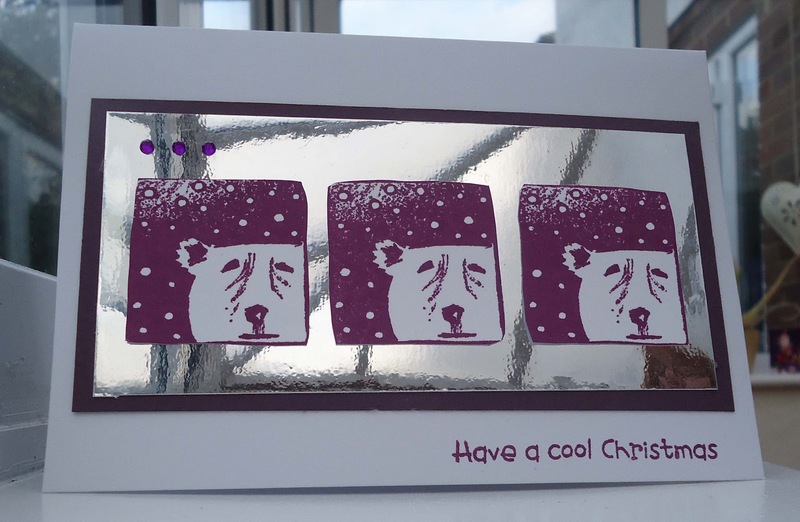 This is another card for one of my team at work - all different but all the same size xard blank and with a snowfall acetate dome front. 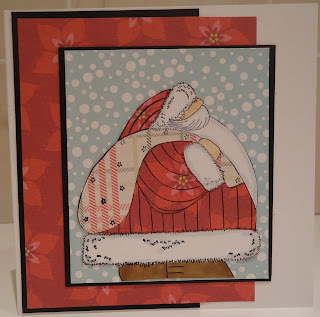 The backgound and Santa sleigh silhouette are printed from a My Craft Studio CD and the postbox is a Molly Bloom stamp, iced with Liquid Pearl. We had our first snow of the winter last week. I put on my wellies and battled my way off to work, only to feel a little strangely dressed when I got off the train to find there was no sign of snow in London! I'm making cards for my team at work. They're all different but I've kept to the same size card blank for all of them and also covered each card with a dome of snowfall acetate. This image is from A Day for Daisies. 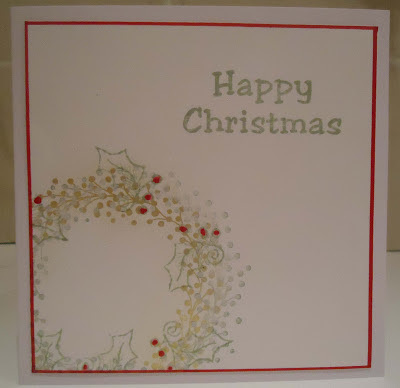 I used a Marianne die for the circle (shame you can't see the glitter on the paper) and lots of Liquid Pearl. You can get such fabulous effects with these intricate dies but - oh- you do have to do a lot of poking bits out! You can't see it, but these shapes were cut out of white glitter paper . The filigree dies are both Memory Box. 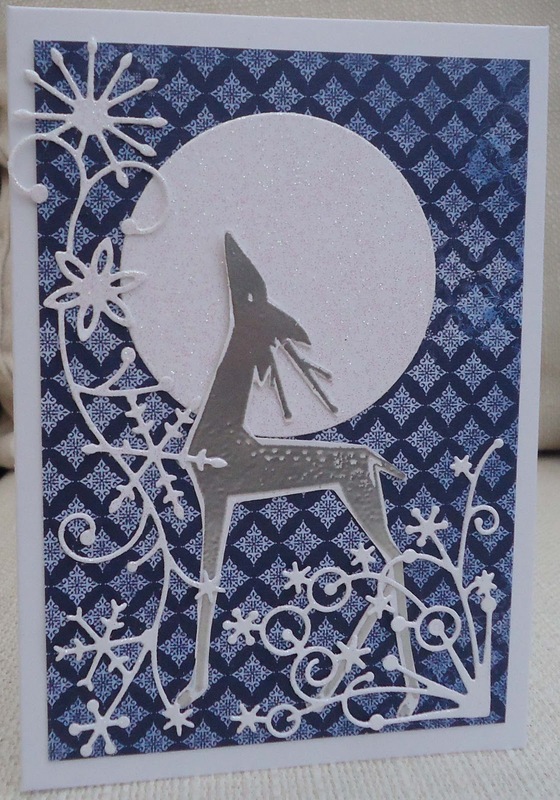 The deer is my old faithful Non-Sequitur stamp, embossed in silver. It used to be so simple: cute baby + Santa hat = cute photo. Now , after 5 years, it's becoming increasingly difficult to get a good photo of my son. Out-takes included funny hand signals, strange grimaces and sticking his finger up his nose to annoy me. Eventually I managed to get a decent shot. I cut the background out (TV in the background didn't look too festive) and mounted it onto gold. This card will be going out to just a few close family members. I seem to have injured my back (maybe when I slid down an icy hill the other day!) 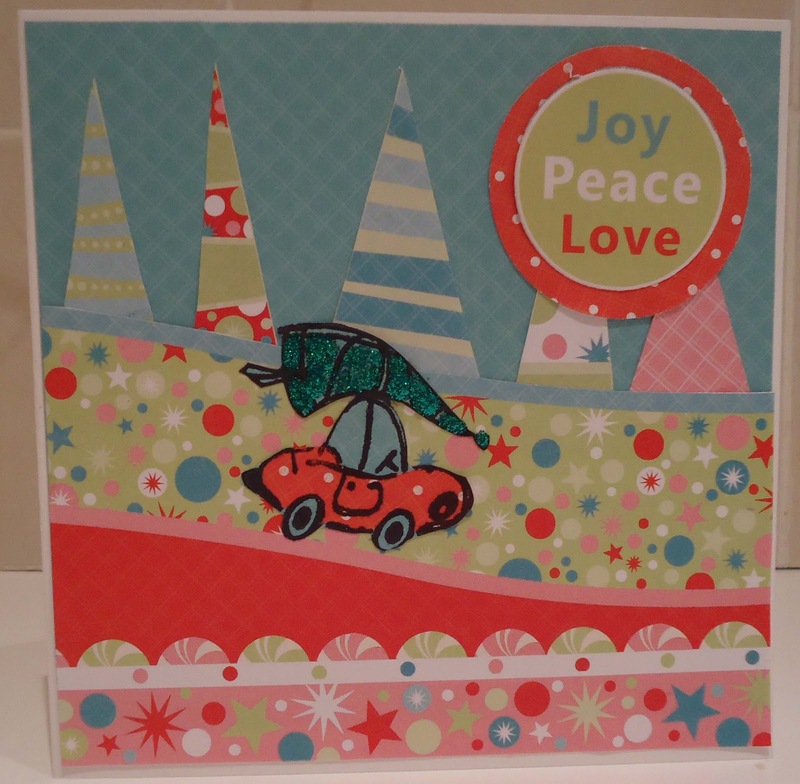 but the show (aka Christmas card-making) must go on! 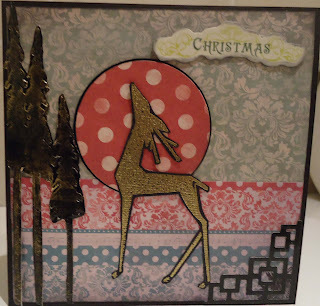 Here I used a Molly Bloom stamp with a Sizzix die cut star and a fancy die cut circle (Marianne I think). I coloured the boy with Promarkers and paper-pieced his hat and scarf. I’ve just checked back and seen that I made my first Christmas card back in July…and yet still I’m having a last minute panic! 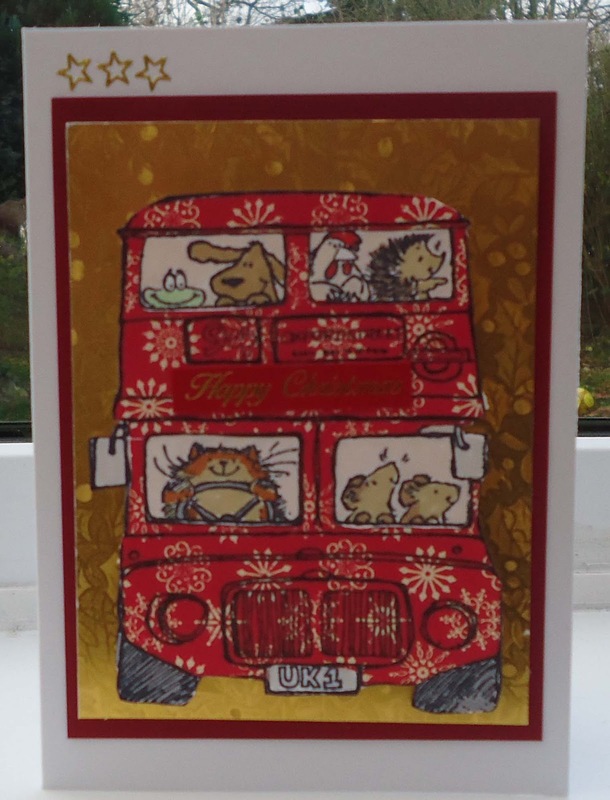 My partner is a classic bus enthusiast (oh yes) and so I always make a couple of bus themed cards for his friends. 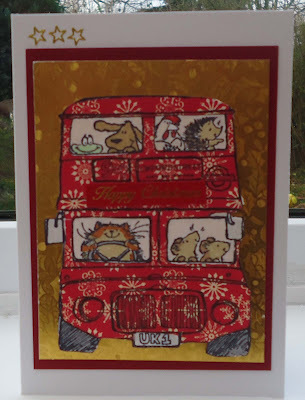 Here I made a Penny Black bus stamp look Christmassy (I hope) by paper piecing with Christmas paper and adding red and gold. 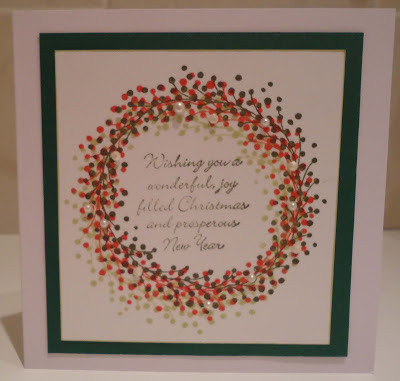 Here's another card using the Penny Black wreath stamp. This time I stamped it in Versamark clear ink and brushed over with gold Pearl-ex . Then I stamped again in Ivy Brilliance ink and used the same ink with a little Blade Rubber holly stamp, which I stamped randomly-ish around the wreath. Finally I coloured the berries red. This week's CD Sunday challenge is Oh Christmas Tree and I searched all my craft CDs for Christmas trees but none inspired me. I decided instead to make an old-fashined scene , featuring a Christmas tree. This room scene is from My Craft Studio Setting the Scene Christmas CD. The mother and child are an A Day for Daisies digistamp that I coloured in , cut out and stuck into the room. I used the sketch at Christmas Card Challenges. 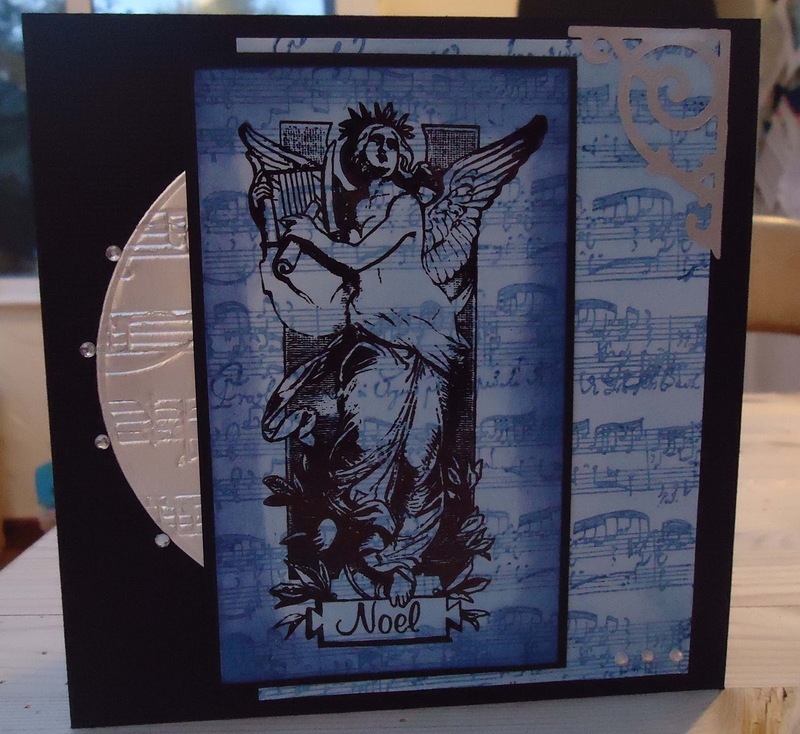 The Christmas tree backing paper is from the same CD and I stamped the sentiment onto the same paper. Finally, I added red glitter glue to the baubles and the sentiment. 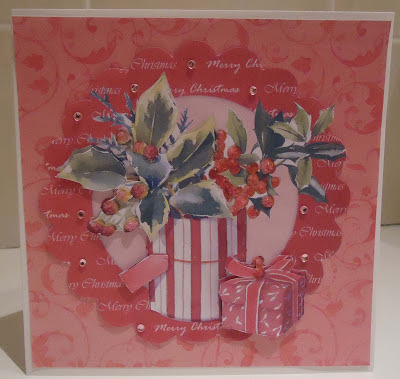 I've been playing around with this stamp , Berry Wreath, from Penny Black. I stamped it three times in Distress Ink - Forest Moss, Bundled Sage and Barn Door. The sentiment is from a Papermania (I think) acrylic set.Finally, I added pearls . Penny Black at Allsorts It's your choice. This little ski-er (LOTV) is making an appearance on my Christmas cards for the second year. 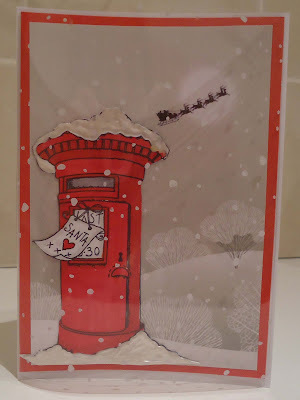 I like rediscovering my Christmas stamps , don't you? I coloured him with Promarkers and paper pieced his clothing. 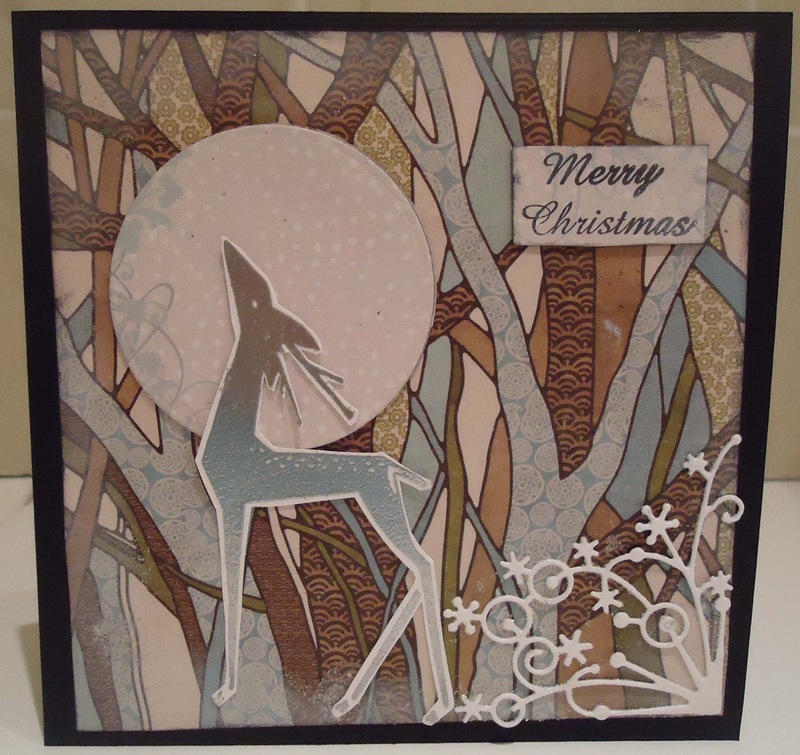 All the papers and the brad are Bo Bunny Powder Mountain and the tree is a Sizzix die. I was a bit stuck for ideas for the CD Sunday challenge Inspired by Nature, until I was inspired by one of the participants, Sue T .
Sue had used a robin image from La Pashe and had really made the reds stand out by using a blue background. Well, I didn't want to totally copy her in the same challenge(!) but I wanted to think of another way to make the reds the focus of the card. 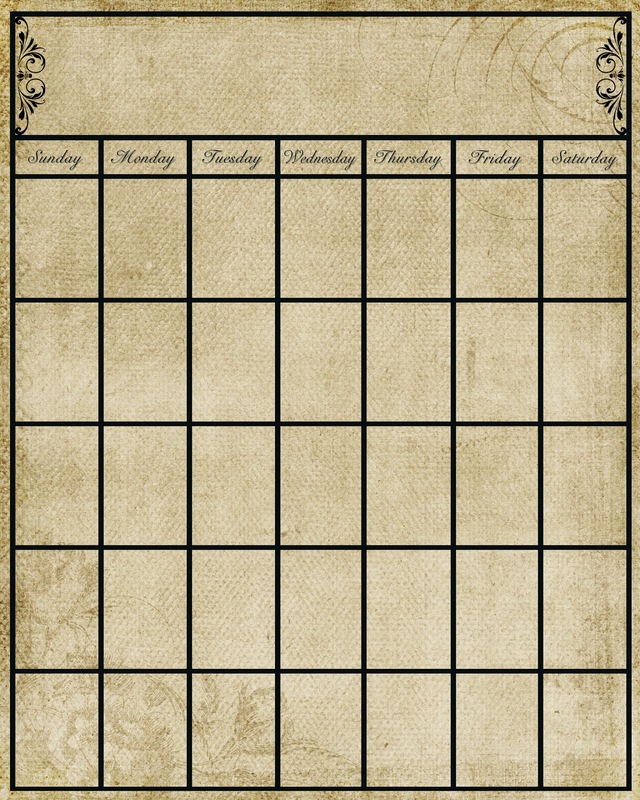 First I found the image on La Pashe Just Inklined and,using the colour boost tool in My Craft Studio, changed the black lines to a sepia colour. I coloured the image in with Promarkers keeping everything to neutral (from the skin-tone set!) except the red. The music paper was also from the La Pashe Cd. This mirror card is so mirror-ish that it was hard to get a photo. In the end I used the self-timer on my camera and just had to accept that my house would be reflected in it! I used a Magenta stamp, stamped in Damson Distress Ink and cut out three times. 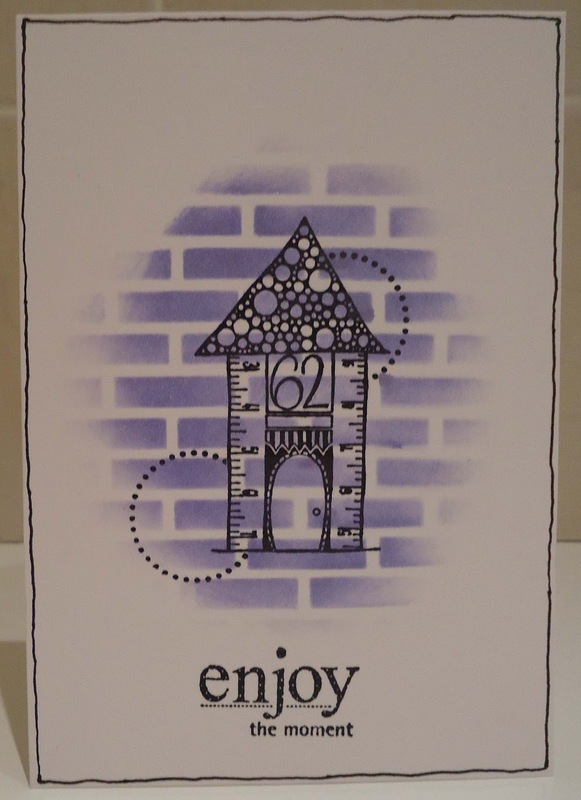 The sentiment comes from a acrylic stamp set - think it might be Woodware. Black on a Christmas card - classy or gloomy?- Discuss. 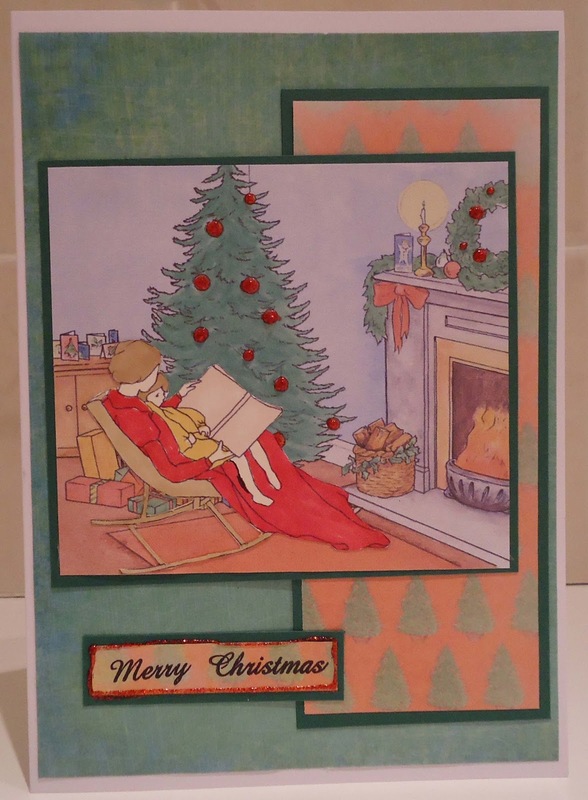 Either way, I'm about 35 cards short of a Hallmark multipack, so I'd better speed up my Christmas card-making with some quick and easys like these. Another vintage photo from Joanna Sheen Fashion CD. What's really annoying is that. although I made this card to fit in with Charisma Cardz colour challenge, the photograph makes the colours look wrong! That red is really a maroon. The other challenge I made this for is A Day for Daisies and they have provided the snowman image to use for this challenge. Yesterday some (usually non-crafting) friends came over to use my stuff to make Christmas cards. Guess who did the least card-making? Yes, me. In fact, I spent most of my time trying to stop my little boy glittering the floor and providing refreshments. 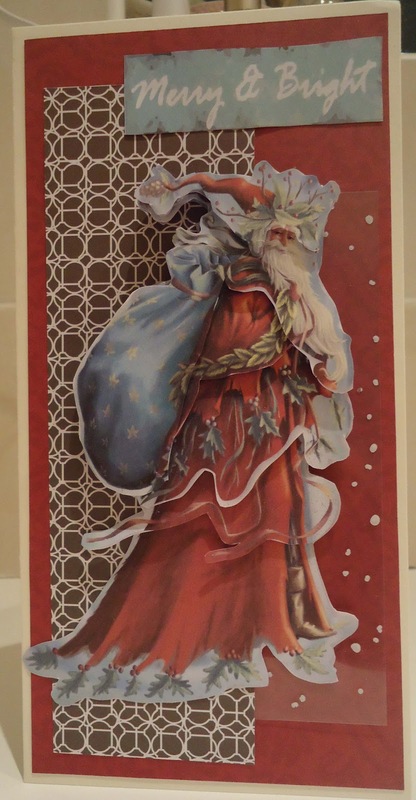 This paper-pieced Santa was the only thing I made and I had to finish it off after they all left. The image is a Stamps Happen rubber stamp. These papers were a free gift with a magazine year/s ago and I thought I'd try to use them up. The car is from a clear stamp set (Woodware?) and I used green glitter glue on the tree. I'd like to enter this for the Non-traditional Christmas challenge at Dream Valley Challenges. 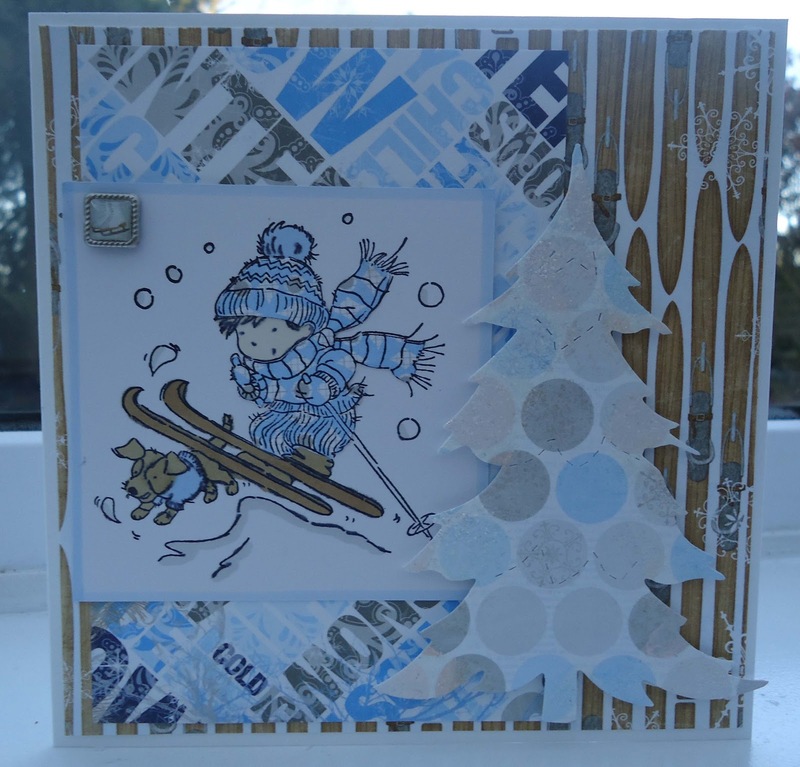 This week's CD Sunday challenge is :'Layer it up'. 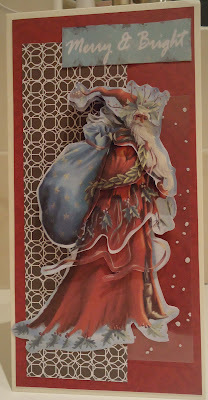 I used a decoupage sheet from Papermania Enchanted Christmas CD,and built up 6 layers while watching TV with my little boy. I sprayed it with glitter, but it doesn't show in the photo. 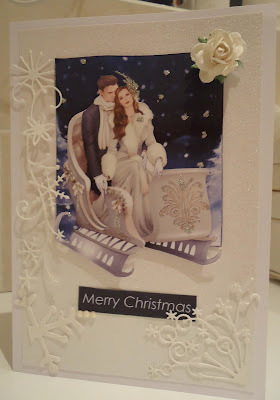 The background papers are also Papermania - Jesse Edwards, Home for Christmas. I do have this set on CD but in fact, these were from a paper pack. I also added another layer with an offcut of snowfall acetate. 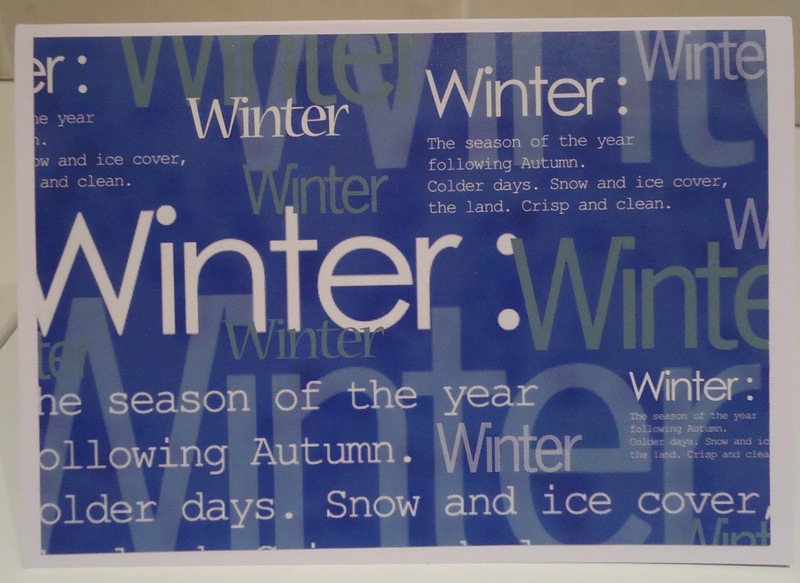 The sentiment was cut from a freebie paper kit I had hanging around. As well as CD Sunday, I'd like to enter this for Crimbo Crackers Anything Goes. I'm enjoying playing with vintage style photos at the moment. The papers I used here are by Cosmo Cricket. This is a new image 'Acorn Boy Fairy' from A Day for Daisies. 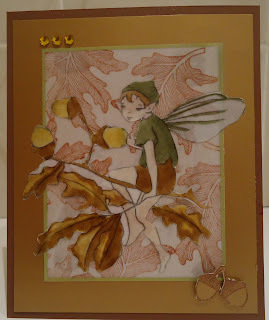 I printed it onto vellum and cut it out and stuck it onto a vellum background, stamped with Stampin Up leaves. 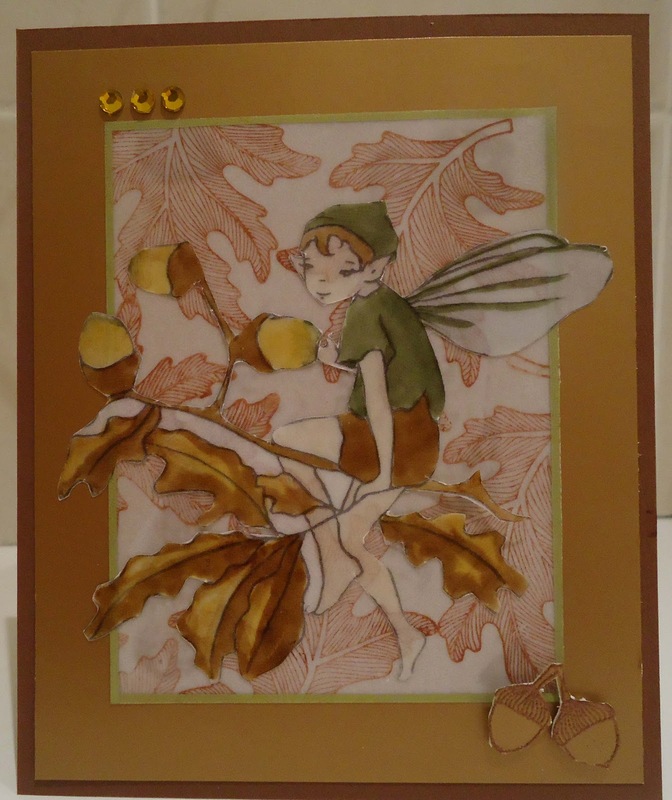 The acorns bottom right are Stampin Up too. I'm still playing with my Christmas tree die from Dee Distinctively. It cuts 5 separate triangles, so you can vary the size of the trees depending on how many triangles you use and how you overlap them. Once again, I used my trusty spotty embossing folder, and also an Echo Park sentiment sticker. 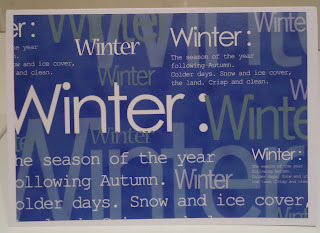 I made a dome front using acetate.The acetate is from Hunkydory and is pre-printed and embossed with a snowfall design. I'm over-using the spotty embossing folder, but I just can't help it. There doesn't seem to be much that wouldn't be enhanced by some embossed spots! This self-assembly Christmas tree die , by Dee's Distinctively, is one of my latest purchases. The girl is by Dearie Dolls. Little Red Wagon Texturise it. This is very sparkly in real life - doesn't show up in the picture! This deer stamp, from Non Sequitur , has been a fixture of my Christmases for about ten years (longer than my partner or son!) - but I can still think of ideas to use him. 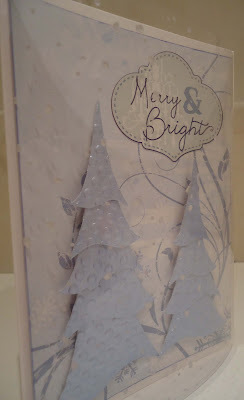 For the top card I used Prima 'North Country' papers, a circle die, Memory Box snowflake corner die , silver embossing powder (for the stamp and also randomly sprinkled into white ink on the edges of the background paper) and Glamour Dust. I just wish all my sparkles showed up in the photo! 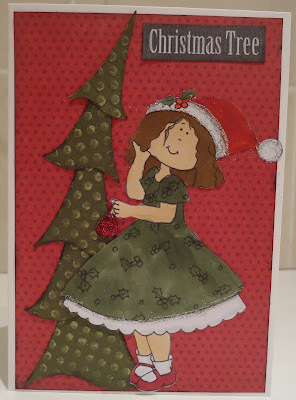 a Sizzix Tim Holtz embossing folder (Xmas trees) that I then cut out and Kaisercraft papers. 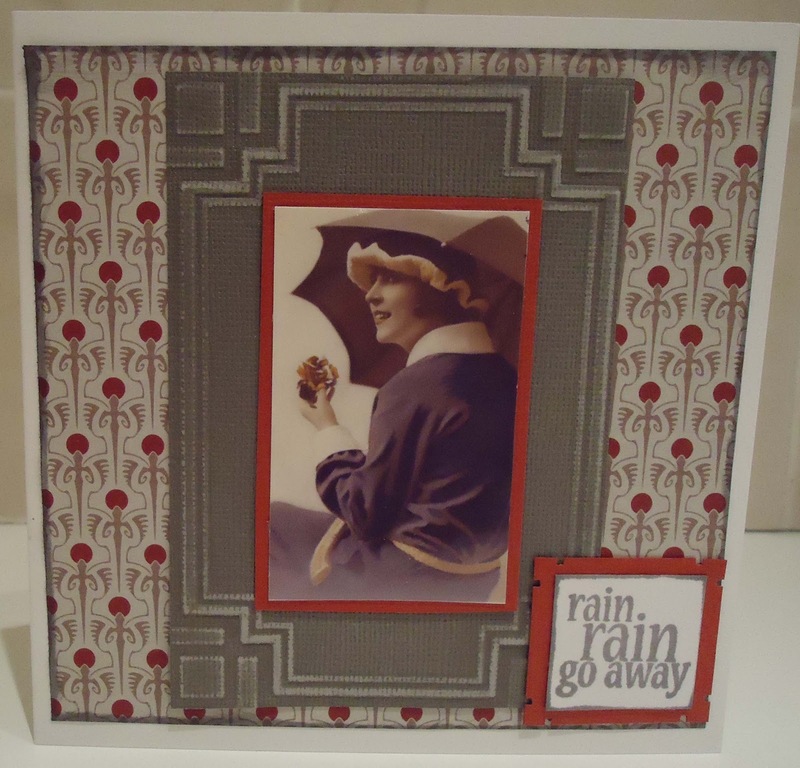 I think I may have taken a little artistic licence with this week's theme from CD Sunday - Rainy Days. It doesn't look as if this umbrella has ever seen a drop of water! This image is from Joanna Sheen's Fashion Boutique CD. 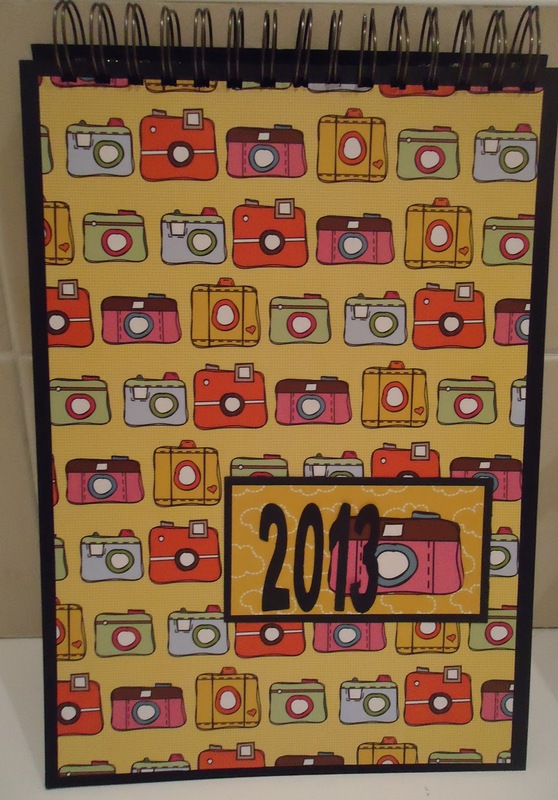 I slightly recoloured it in My Craft Studio and printed it onto photo paper. 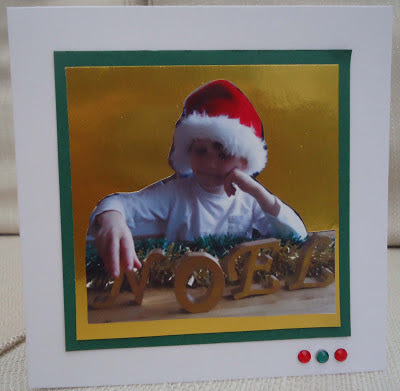 The frame is a Docrafts Triboss embossing folder, embossed on Coredinations card, trimmed down and sanded. 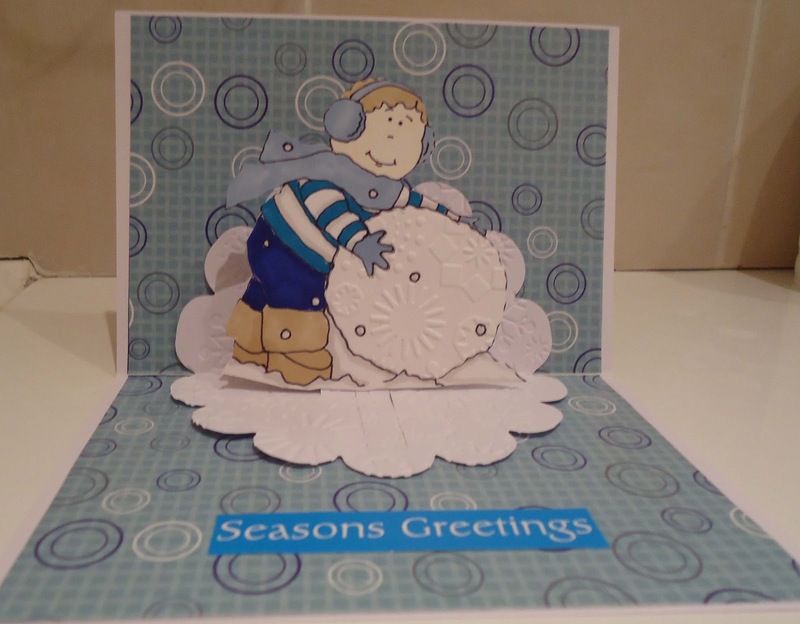 The backing paper was free with Making Cards magazine. The sentiment is a Unity stamp and I think it would work as a 'thinking of you' card for someone having a difficult time. I'm in clean-and-simple mode now. 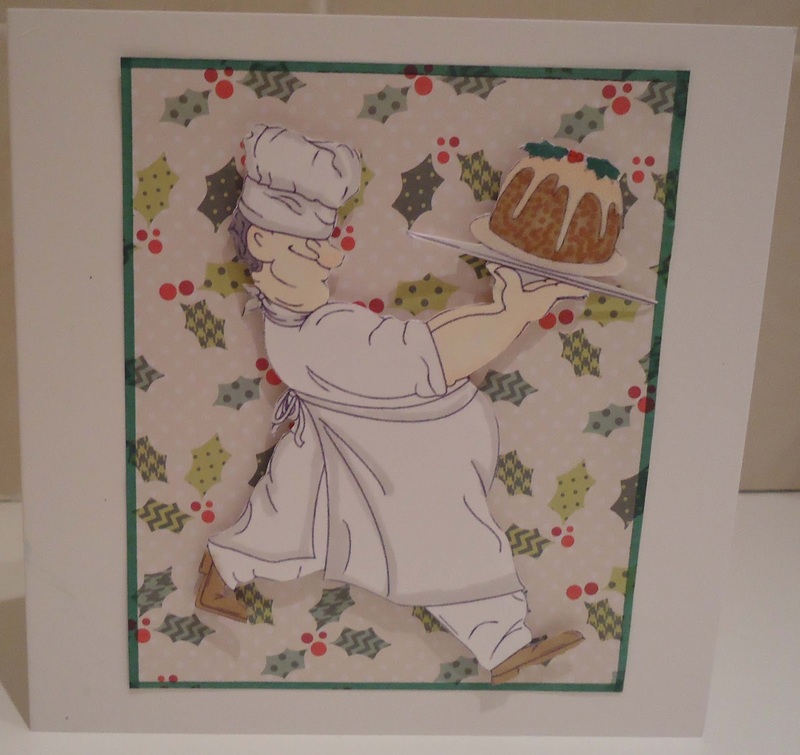 This chef is a digi-stamp (sorry can't remember who made it - I think I won it in a challenge). On the chef's tray is a cupcake , but I covered it over with a Christmas pudding. The backing paper was free with a magazine - so overall this was a real cheappie to make. WinterWonderland One for the boys. I have a little confession to make - and I hope this doesn't get me expelled from the Less is More challenge. This card is a fake. It is supposed to be a one-layer-card for the challenge 'houses' but in fact it is just a card front. You see.....my usual technique, when I make a mistake (which I usually do) is to slap another layer over it. But in this challenge, I couldn't do that, so each time I made a mistake I got out another card blank and started again. 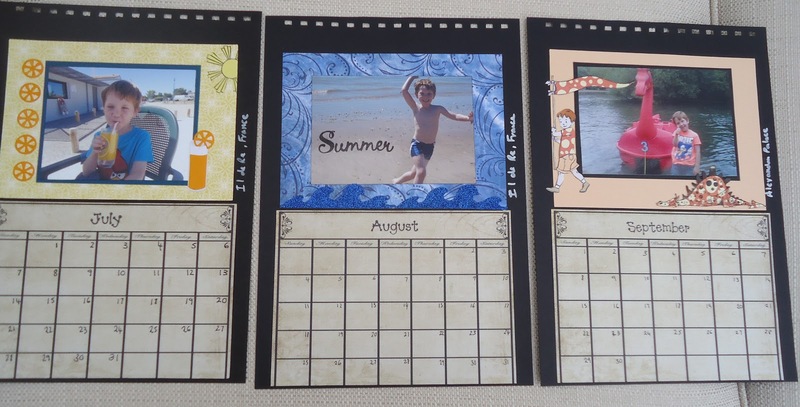 I soon realised I was going to run out of blanks and started cutting the backs off and using them. So this card is a card that could be a one-layer-card in the hands of someone more efficient. 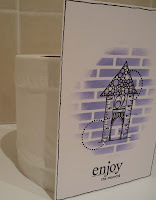 I sponged lilac Brilliance ink through my favourite Stamposaurus bricks stencil. 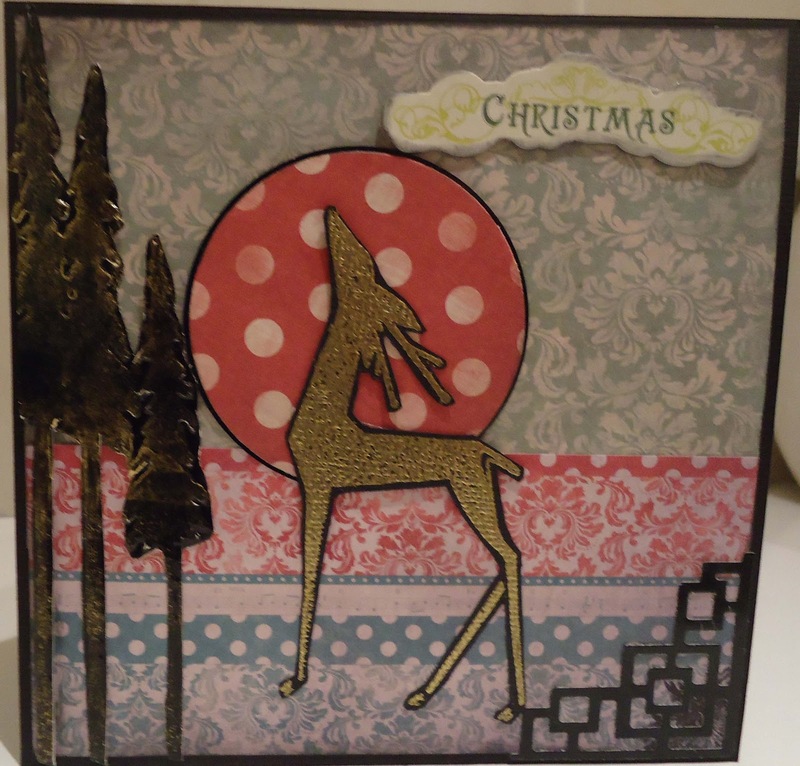 I stamped the Paper Artsy house, masked it and stamped the Hero Arts dots circles. The sentiment is from Unity stamps. 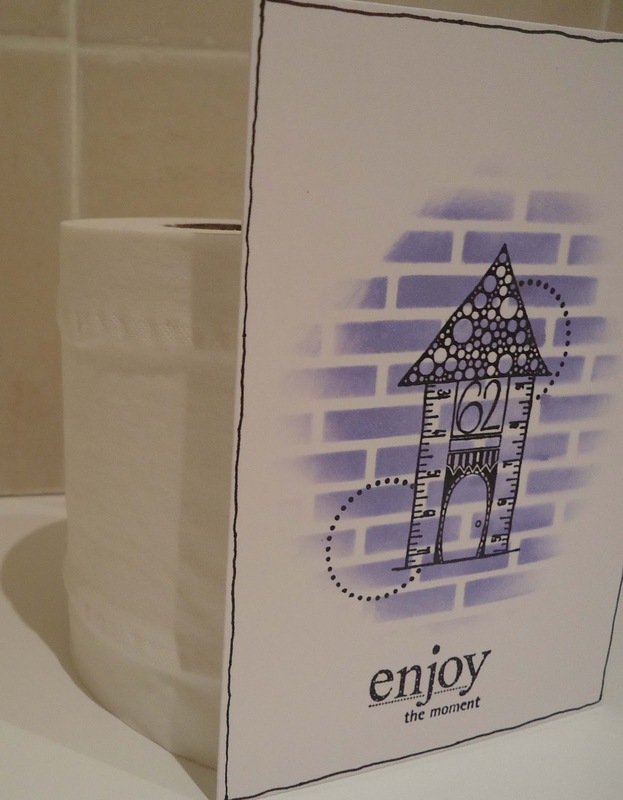 It did say 'enjoy - savor the moment' but I cut off the 'savor' as it's an American spelling and I'm English and I just couldn't do it! (I'm a teacher!) 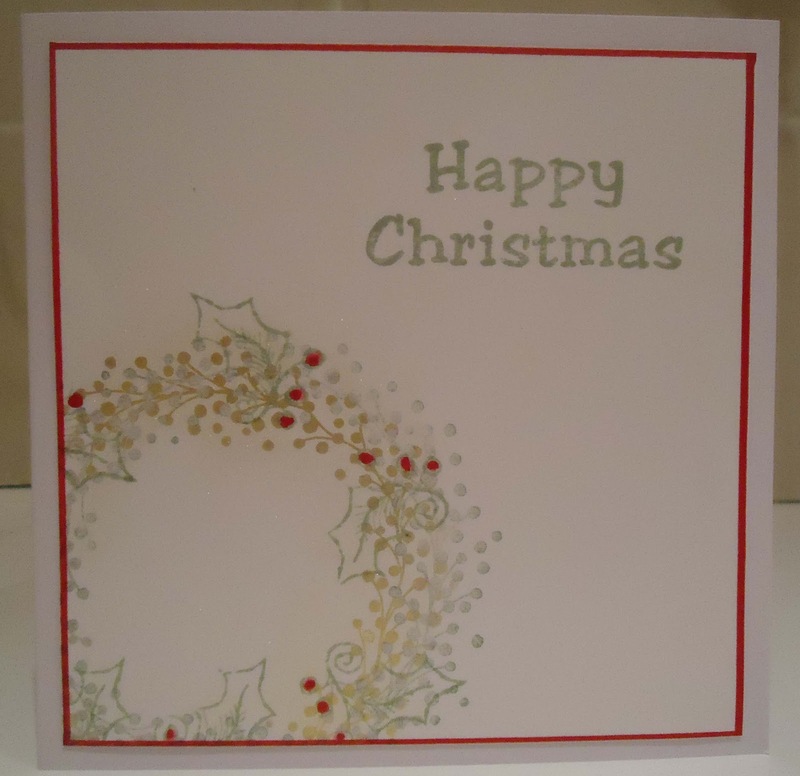 Finally I hand-drew a border round the card. Back to the Christmas cards. Both the stamps used here are oldies-but- goodies: the angel is Non-Sequitur and the music is by Toybox. 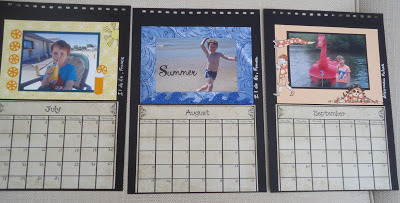 I also used Distress Ink pads and a music embossing folder. I fancied making (another) autumnal card and as my inspiration, used the challenge theme at Make My Monday, Kraft and Twine. The angle of the twine was supposed to enhance the feel of leaves blowing into the air, but I'm not convinced it worked very well! 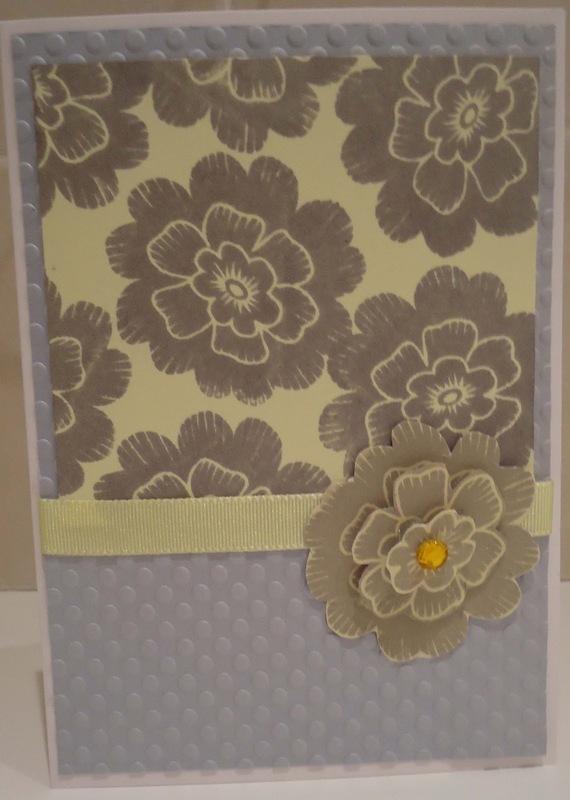 I used an A Day for Daisies image, Basic Grey paper from the Mellow range, gems and a leaf- headed hat pin. I embossed the apron with a leaf embossing folder. 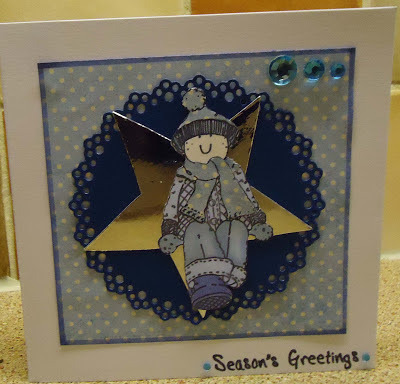 I've been busy with Christmas cards, but when I saw Papercraft Star's challenge 'Yellow and Grey', I thought I'd join in, as I love this colour combo. 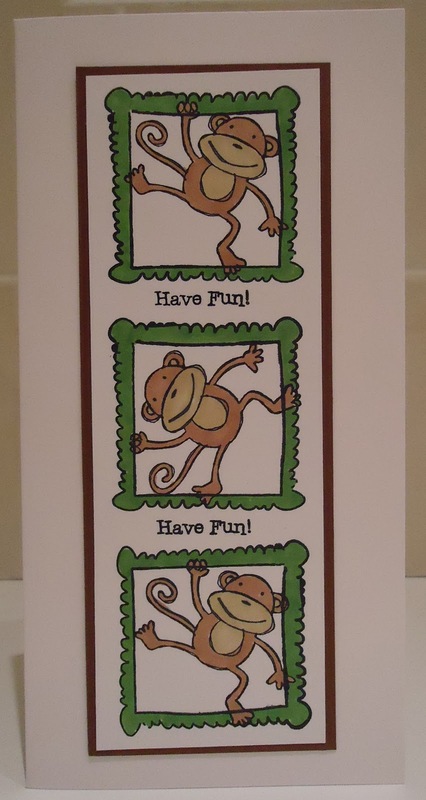 I thought this might be a good card to have put by in case I have to send a card for a not-so-happy occasion. The flower stamp is by Stampin Up and I stamped it in grey ink onto yellow card. Then I stamped it again, three times, onto pearlescent yellow card, cut the bits out and layered them up. The background is pearly-grey card run through an embossing folder. 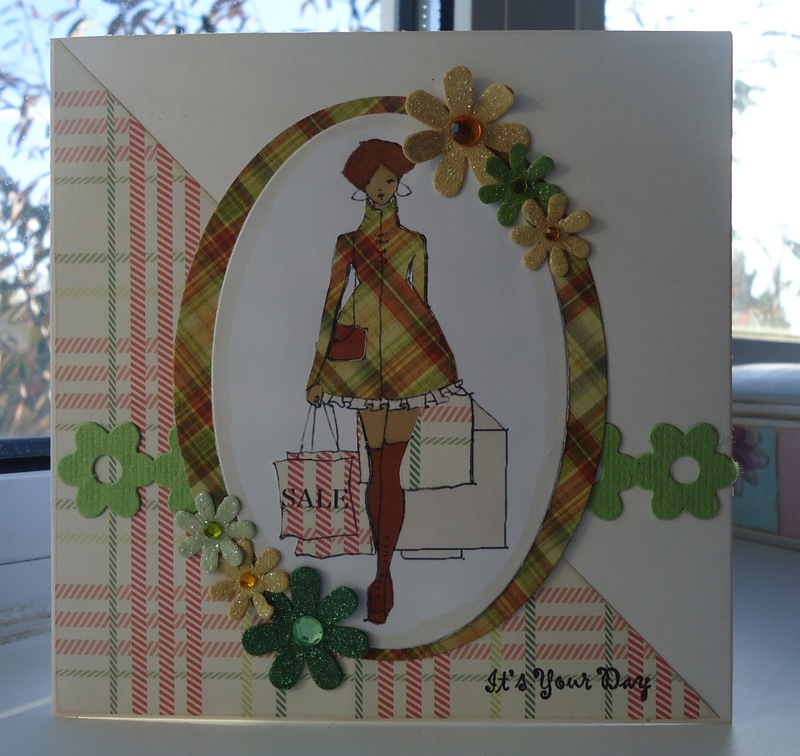 This pop-up card was made using free-gift papers and a Sizzix pop up die. 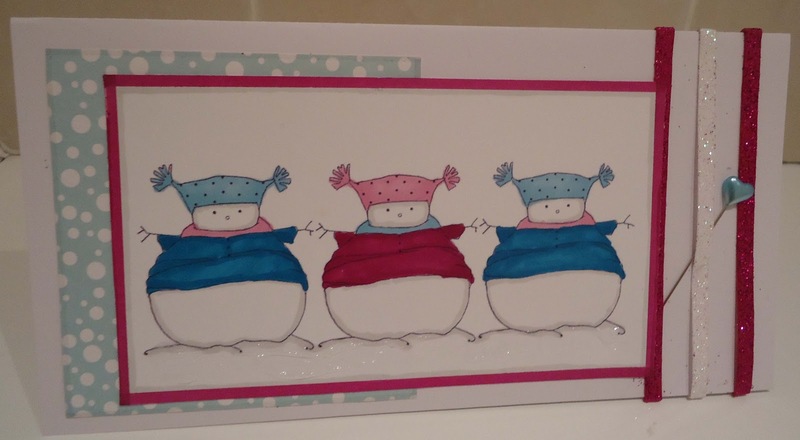 The image is from Dearie Dolls- I coloured it with Promarkers and paper-pieced the snowball with embossed card. 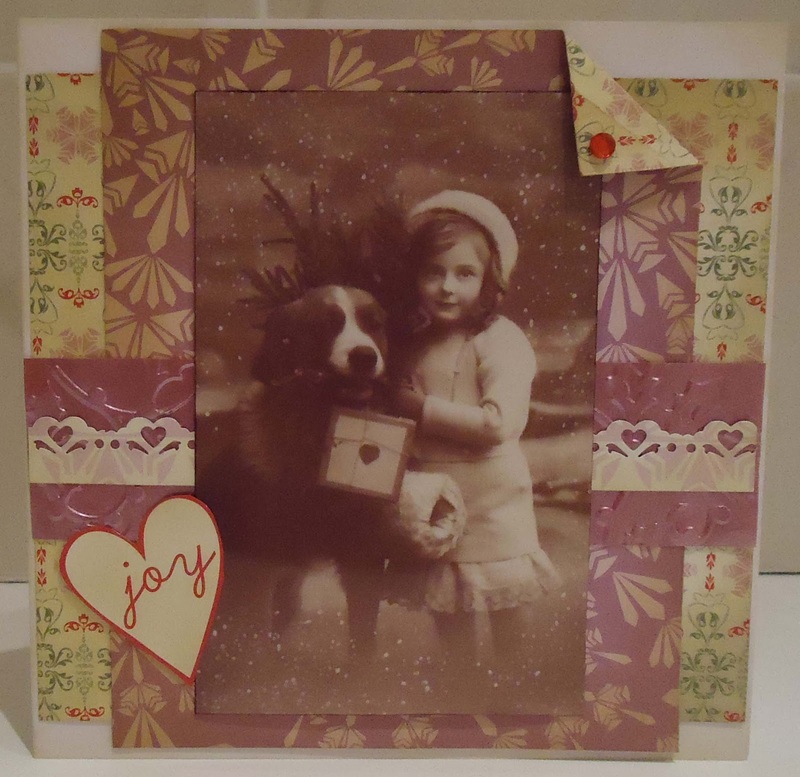 This week's CD Sunday challenge is Christmas in Pink. 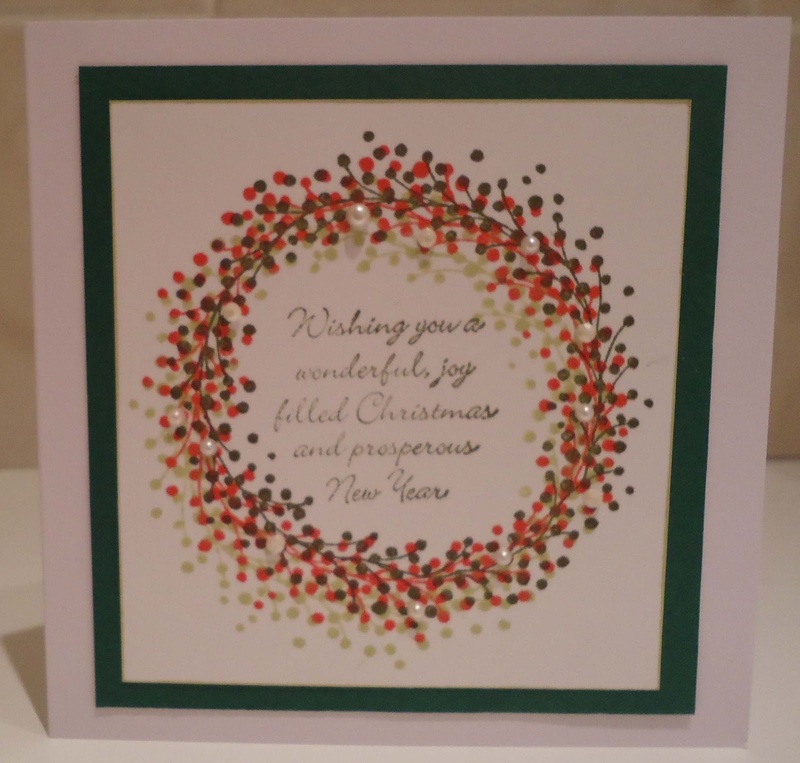 All these elements were printed from Papermania Christmas Past CD - Henbury Lane Poinsetta. I decoupaged the main image and added pink gems and glitter glue . As usual the glitter doesn't really show in the photo, so I did a little close up.